Epson today announced the Stylus Photo R1900, a $550, B-size (13" by 19") desktop printer with pigment-based inks, advanced paper-handling capabilities and productivity features aimed at serious amateurs and professional photographers. 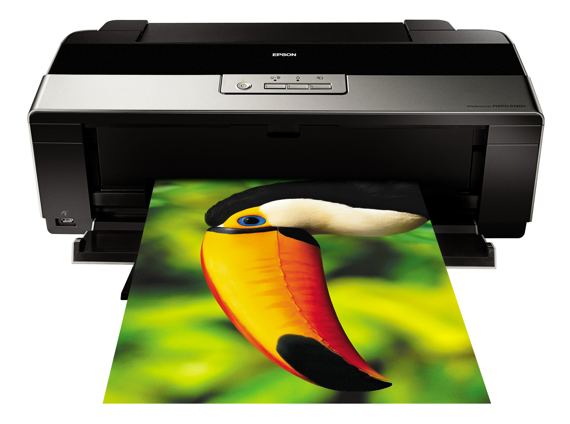 Unlike the pricier Stylus Photo R2400, which is best known for its black-and-white printing capabilities (and its voracious appetite for ink), the R1900 is designed primarily to produce optimal color prints. In place of the R2400’s light black and light light black inks, the R1900 has a gloss optimizer cartridge that sprays a clear overcoat on top of glossy media, producing a “superglossy” print that lacks the bronzing or dullness found in glossy prints made with most pigment-based printers. The R1900 uses a reformulated inkset, called UltraChrome Hi-Gloss 2, consisting of eight individual inks: the gloss optimizer, matte and photo black, and cyan, magenta, yellow, red and orange. Epson claims that the orange ink, which replaces blue in the original Hi-Gloss inks, increases the printer’s overall gamut and provides improved flesh tones, while the new formulations of magenta and yellow inks improve the blues and greens, respectively, in most prints. In a nod to HP, which has been making hay with the densitometer incorporated into the the Photosmart Pro B9180 ( ), Epson also says that the R1900 will be color-calibrated at the factory, a process that will produce consistent color from unit to unit. (This has been something that Epson has long done during the manufacturing process for its Stylus Pro printers.) The printer will also come with a set of ICC profiles for most Epson media types, including glossy, matte, and fine art papers and canvas. The R1900’s printhead has been coated with an ink-repelling coating, similar to the one in the x880 line of Stylus Pro printers introduced earlier this year. The coating is designed to help reduce clogging and ensures precise dot placement over time. A new mist-collection system is also in place, to help minimize ink spray during the printing process. In the release notes, Epson claims that this will keep the inside of the printer much cleaner, but we also believe that the mist-collection system, which uses negative and positive charges to move any overspray to the absorption sponge, will also help reduce clogging. One other enhancement designed to help clogging: the R1900's ink cartridges will have tiny glass beads in them, similar to those found in cans of spray paint. As the printhead moves across the page, the beads will agitate the ink, helping to keep the pigment particles from clumping. The R1900’s print handling appears to be as good as that of the R2400: it will print photos from 4" by 6" to 13" by 44", and supports borderless printing at most of the popular sizes. In addition to the standard paper input tray, the R1900 supports up to 13-inch rolls and has an input tray for handling thicker fine art papers, as well as a CD tray for printing on inkjet-compatible discs. It has two USB 2.0 ports on the back; Epson says that the two ports are not daisy-chained, but are instead designed to let you use the printer with two computers (a laptop and a desktop, for example). The printer also has a PictBridge port for printing directly from compatible digital cameras and Epson photo viewers. We haven’t tested the R1900 yet, but the sample prints Epson showed us were impressive. We liked the look of the R1800’s glossy prints—they were as good as, if not better than, the best dye-based glossy prints—and R1900 prints we looked at kicked it up a notch. The new gloss optimizer, which Epson says is more transparent than the first generation spray, produced no visible gloss differential in the samples, and we would expect that in our tests as well. And, while the R1900 is optimized for glossy papers, the inclusion of matte black ink means that its output on matte paper types should be very good as well. Unlike the R2400, which requires you to swap out the matte and photo black inks when you change paper types, the R1900 has separate channels for each black ink, using the appropriate ink for the paper you’ve chosen in the print driver. Of course, without the light black inks, you won’t get the rich, deep tonal range of the R2400 when printing black-and-white images, but the R1900’s black-and-white output should still be passable for most people. One thing we’ll be keeping an eye out for is Wilhelm Research’s print longevity tests for the R1900 and Epson papers. Their results for the R1800 showed print life of more than 100 years (under glass) for the Premium Glossy and Enhanced Matte papers, and we would hope that the R1900 at least shows that, but with the change of the inks, it’s not certain. Pigment-based printers have long been the province of the pro end of the inkjet printer market, although the Big Three vendors—Epson, Canon and HP—have steadily been moving down to the consumer end of the market, dancing around that magic $500 price point. HP’s Photosmart Pro B9180, which lists for $700, is regularly under $600 in most stores, and the R1900 should compete very well with that model. The coated printhead and the mist-collection system should help Epson with the knock that its printers clog more than those of the competition, which is a perception issue for some users, and reality for others (and a non-issue for the Stylus Pro line). What’s most interesting about the R1900 is Epson’s focus on optimizing for glossy prints. Most serious amateurs and pros stay away from glossy photo papers, preferring to print on matte, fiber-based or fine art paper types. But the reality is that many people—especially when printing at home—love the look of glossy prints. And the R1900, although priced a bit higher than the average home user might like, should offer some of the best glossy output on the market. For the serious photographer, Epson is tossing around words like “sellable” and “gallery-quality” when referring to the R1900 output, terms that have long been reserved for the company’s Stylus Pro printers. While we might look a bit askance at those claims—after all, the R1900 is a 6-color inkjet—the R1900 does look like a solid improvement over an already good printer. We’ll reserve final judgement until we’ve had a chance to test it fully, but we think it’s an exciting addition to the $500 photo printer market.